Cushion cut blue sapphire gemstone in claw set diamond halo surround. 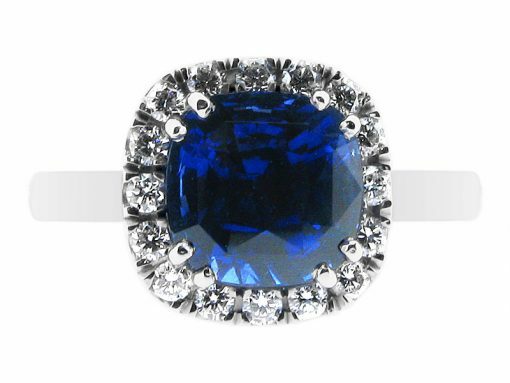 This gorgeous cushion cut blue sapphire is set in a tall scallop set diamond halo with a plain band. Sapphires are ideal engagement ring gemstones due to their hardness and durability. They come in shades from very light blue to a deep French navy blue. This style can be made in 18k rose, yellow, and white gold, and platinum. Call us today to book your consultation and view this and other similar styles. We are happy to discuss bespoke making custom rings for our clients also.